'Side-hustle' isn't merely a trendy buzzword; Emma Gannon believes it offers a clue into a new way of working that can unlock creativity. Here the author, podcaster and blogger speaks about her new book and mission to revolutionise the world of work. "We’ve changed the way we date, the way we travel, the way we order pizza. Our whole world is so different now, yet we still go into an office and sit at a desk." "Work less, create more, and design a career that works for you." "It’s going to be the most exciting time ever to be a creative," she says. When Gannon moved to London after university eight years ago, the country had recently come out of a recession, so she took what she thought would be a safe route. She got a job at a PR agency and began to work with some of the world’s biggest brands. Still brimming with ideas that didn’t find an outlet at her job, she started a lifestyle and travel blog that went on to win a prize at the 2015 National Blog Awards. Gannon later transitioned from marketing to journalism, working at the now defunct The Debrief and as social media editor for Glamour. Meanwhile her side-hustles grew, and the rungs above her career ladder seemed increasingly unappealing. "Sometimes I would look at my boss and think, that’s not my definition of success. Maybe for your generation it is, having the corner office and sitting in your fancy glass space with a lovely marble desk, but I just never wanted that," Gannon says. "So then you move sideways." Over two years ago she decided to make a leap, trading her comfortable magazine job for self-employment. For Gannon it has paid off, and she says designing her own way of working has allowed her to be even more creative. She published her first book, a memoir called Ctrl Alt Delete: How I Grew Up Online, in 2016. She then started a podcast by the same name, which has been nominated for a Webby Award. Last year Microsoft picked Gannon to front an advertising campaign in which she champions being a "slashie", or doing multiple jobs at once. That validation from a major global brand was a "turning point," she says, where she realised slashies were not an anomaly but instead represented the future world of work. 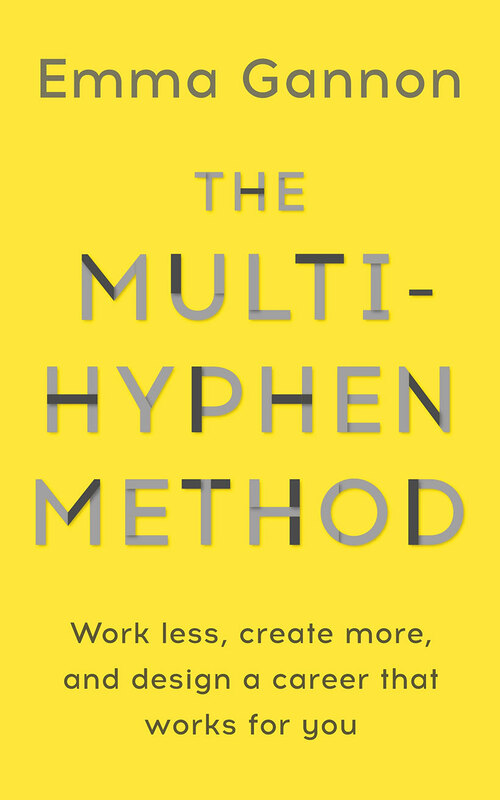 "The multi-hyphenate lifestyle is about having a mishmash of projects going on with different income streams attached that make up a salary, instead of it coming from one source," she writes in the book. "It becomes more about who you are, what you are interested in, what pays the bills and what your hobbies are. All these things make up your different ‘hyphens.’ You are a career chameleon, changing and moulding yourself to different projects." Gannon says this method is not just for millennials like her, but for everyone working in a world where many future jobs haven’t even been invented yet. In her book she makes a case for side-hustles and multiple avenues of work, but creatives are sometimes lampooned for having these. Writing in Campaign earlier this year, Creature chief creative officer Ben Middleton said: "For a growing gang, the day job is no longer enough; they’ve got themselves a ‘side-hustle’... they’re going to compromise the hell out of their work in its pursuit." "One of the reasons cultural monsters like Jaws happen is because the creative behind it was fanatically single-minded in the making of it," he continued. "Steven Spielberg wasn’t flitting about… he was totally focused on making the [film] in front of him." But side-hustles, or moving sideways as Gannon often refers to it, can help people become more creatively fulfilled in their work, she argues. When Gannon started her blog, she was unhappy in her day job, and having another outlet actually fed her creativity in the office, she says. Her method challenges a status quo where 76% of workers dread going into their jobs (according to Monster), while the UK is the least productive workforce in Europe. "That is so depressing, and we shouldn’t treat that as normal. I don’t think it is normal to be that miserable at work," Gannon says. "A side-hustle is an antidote to the quit-your-job business books that I don’t like." Not everyone wants to set up a side-hustle or try to make money from their hobbies, but The Multi-Hyphen Method is more about embracing a mindset of experimentation and continuous learning. "It’s about, what do you feel is lacking from your job? Do you think that in five years' time you’ll have looked up and feel you’ve learned nothing new? Because genuinely that’s a scary place to be," she says. Flexibility or juggling various gigs is often associated with insecurity. Yet Gannon believes adopting this way of working will actually set people up to be more secure. She is an example of this; two of her former employers, The Debrief and Glamour’s print magazine, have folded. And media is not the only industry facing upheaval. "I’ve never felt more secure by having multiple income streams and multiple options," she says. "The idea of having one job now is for me more scary." Her viewpoint is timely as familiar hierarchies and business models across industries begin to break down. Some new creative companies are already embracing a different way of working that doesn’t rely on rigorous time-sheets or hoards of employees at their desks. For example, The Hoxby Collective, launched by former marketers Lizzie Penny and Alex Hirst, believes "flexible working is the future of the global workforce" and hand-picks freelancers from around the world to provide services to businesses. The Dots, the creative network founded by Pip Jamieson, connects clients with freelancers in fashion, the arts and technology. And Uncommon, the creative studio started by former Grey London executives Nils Leonard, Lucy Jameson and Natalie Graeme, builds bespoke teams of strategists and makers for each project. Some established companies are starting to recognise the benefits of a more flexible way of working thanks to movements like #FlexAppeal, but is it too late for them to completely change? Gannon is sceptical. "To be honest, I left [my former agency] because I thought, you can’t change a structure that’s been going for 50 years," she says. "You are a cog in a machine, and you can’t just walk in and change their policy." So Gannon left and found a new way. And for other creatives like her, they might just follow suit.